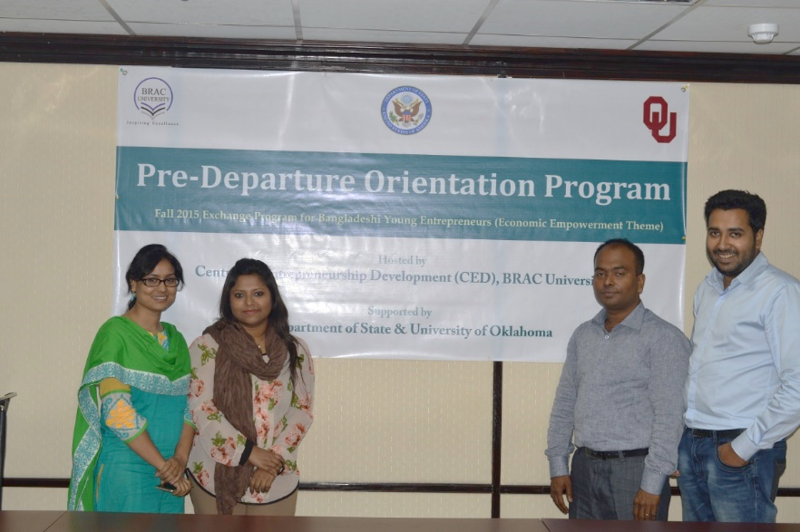 CED has arranged a Pre-Departure Orientation Program for the delegations of Bangladesh-India-Myanmar Young Entrepreneurs Exchange Program on October 5, 2015. This Young Entrepreneur Exchange Program is supported by the United States Department of State and is being managed jointly by the Gaylord College of Journalism and Mass Communication, University of Oklahoma, USA, and the Centre for Entrepreneurship Development (CED), BRAC University. For this high-profile exchange program, four (4) young Bangladeshi entrepreneurs have been selected who are from diverse business backgrounds to visit US for 5 weeks. This group left for US on October 9, 2015.